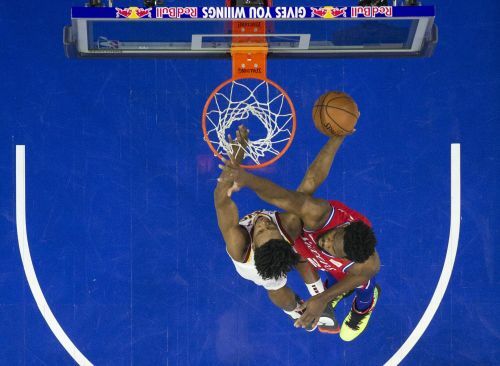 PHILADELPHIA (AP) — Asked to assess his overall performance, Joel Embiid said he was "trash." When the Philadelphia 76ers needed him the most, however, their All-Star center came to play. Ben Simmons scored 26 points, Embiid had 19 rebounds and made some big plays down the stretch, and the 76ers held off the Cleveland Cavaliers 106-99 on Tuesday night. "Myself and Jo, we take a lot of responsibility to try to get the team going, whether it's with energy or defense," Simmons said. "Jo did a great job on the defensive end." Embiid, playing in his second game after missing eight straight with a sore left knee, had a block on the other end and then made four consecutive free throws to seal the win as "MVP! MVP!" chants replaced the boos. "We're just getting back in the flow," Embiid said. "By playoff time, we'll be back to normal." After shooting just 22 percent from the field in the first quarter to fall behind 24-12, the Cavs took a 38-37 lead midway through the second quarter on two straight 3-pointers by Osman. Playing against one of the league's worst defenses, the Sixers had 21 turnovers, including 14 in the first half. "We did a lot of damage ourselves in terms of the turnover," Simmons said. "At the same time, they had the energy, which we were lacking a little bit." Both teams gave key players planned days of rest: Jimmy Butler for Philadelphia and Kevin Love for Cleveland. Besides Love, the Cavs were also missing, among others, Marquese Chriss (suspension), Tristan Thompson (foot), Matthew Dellavedova (concussion) and Larry Nance Jr. (ribs). "I think we're moving in the right direction," Cleveland coach Larry Drew said. "Playing against two tough teams, as we have the last couple of nights, and competing at the level that we've been able to compete at, I think it says a lot about the team." Cavaliers: Former Sixer Nik Stauskas had nine points off the bench, hitting two straight 3-pointers in the second quarter. . Cleveland surprised the Sixers during its last trip to Philly, notching a 121-112 win in November. 76ers: Zhaire Smith, a 2018 first-round draft pick, was recalled from the Delaware Blue Coats before the game but did not play. The rookie, who fractured his foot in August, has yet to make his NBA debut. . Center Boban Marjanovic, who returned to the court after missing six straight contests, scored 11 points after first checking into a big ovation. Making his first start as a Sixer, in place of Butler, James Ennis III scored 10 of his 12 points in the first half. He also had an exciting follow slam at the beginning of the fourth quarter and was, according to coach Brett Brown, "one of the team's best defensive players" on the night. "James did a great job," Embiid said. "He's settling in comfortably. And we're going to need him for the rest of the season and the playoffs." Ennis came over to Philly in a trade deadline deal with the Rockets last month.